"It's Disney so what do I really expect?" The Disney Channel had a big win last week after Descendants 2 hit the network, raking in huge viewing numbers. Fans have praised the performances of the film's leads, but a new revelation about D2 has left some followers scratching their heads. The film, which is based on a series by Melissa de la Cruz, was actually supposed to feature a gay kiss between the characters Gil and Harry Hook. The kiss is also found in the books, so it would not have been out of place if it had aired. Fans were even more baffled to discover that the kiss was actually filmed, not just omitted. Dylan Playfair (Gil) and Thomas Doherty (Harry Hook) both posted an image of the kiss that never made it into the film. 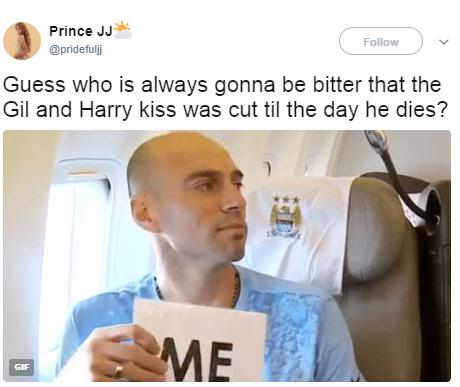 The image has sparked a debate within the comments, with fans arguing both for and against the kiss. Some people have noted that the kiss was probably more of an "excitement" kiss, rather than a romantic one. Regardless of the "nature" of the kiss, many fans still would have loved it to be aired. It doesn't take a media mastermind to figure out why the scene was cut. Even if the kiss was a completely platonic one, The Disney Channel is ultimately beholden to parents, many of whom would take a conservative stance on something like this. The decision to cut the kiss now has some wondering if Descendants 3 would flourish in theatres or even outside the immediate grasp of The Disney Channel.